← Armholes, Sleeve Caps, and Cables – Oh my! 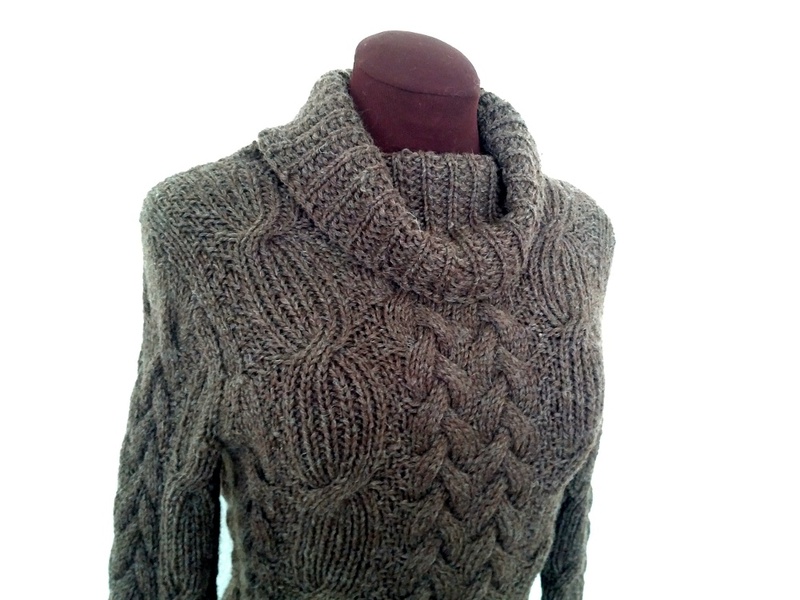 Finally, the conclusion of the cabled sweater story! Get the first three installments here, here, and here. Why is it that knitting the sleeves seems to take absolutely forever? After all they’re just a fraction of the knitting, compared to the body of the sweater. I can understand them taking a long time if they’re boring – who wants to go round and round and round when they’re ready to wear the sweater already? 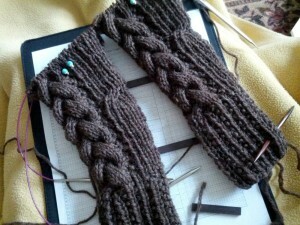 But these sleeves have cables, and ribs, and textured stitches. There should be plenty to hold the attention of the knitter! Apparently not. Around the time that the sleeves reached the elbows, my nose began to return to normal and I tentatively ventured back out into the world. My mind wandered to the next project. 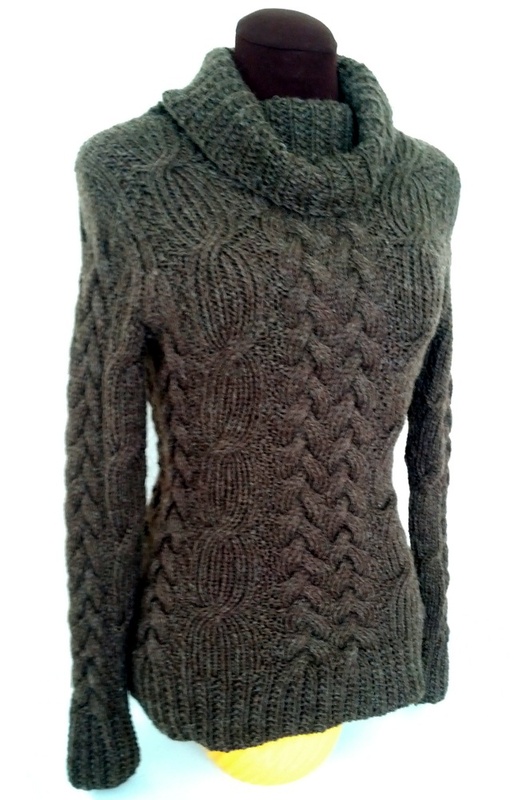 My hands were reluctant to pick up the sleeves and knit a round or three. The knitting excitement that had knocked out a heavily cabled sweater body in under a week was nowhere to be found, and these sleeves were coming up on a week on the needles. By Friday of the second week of the sweater, I was disgusted with my lack of forward progress on the sleeves. There were only a few inches to go before the sleeve caps. Just get it done already! So I resolved to sit down with my knitting and not put it down until it was finished. Which turned out to be just the thing. Those last few inches flew by and before I knew it I was shaping the sleeve caps. Zoom! And they were off the needles. Time for the moment of truth; would the sleeve caps fit the arm openings? I began to pin the sleeves to the sweater body. Holding my breath, willing the stitches to work with me. And…it worked! The sleeves fit perfectly into the arm openings! I was giddy with relief. That was the scariest part of the whole project. I danced around the house with glee. But I wasn’t finished yet. Once all of the knitting was finished, I went to the mirror to try it on. Once again, I held my breath. And…it fits! Not perfectly, but it’s definitely wearable. I’ve decided to add a few stitches to the circumference of each sleeve and to the sweater body of the final version to make it more comfortable. This adjustment is not necessary, but it would make me feel better. The yarn relaxed and softened, as expected, after a nice soapy bath. This sweater will be a warm, classic wardrobe addition. And look at how flattering it is to the body. I’m absolutely thrilled with the results! Now to write up the pattern, find the perfect soft grey yarn, and do it all over again. This entry was posted in Knitting and tagged creativity, design, knitting, sweater, winter, wool. Bookmark the permalink.